Knights of Creativity Spirit & Ale: Sweet! a little thing called the NCAA Basketball Tournament is pretty big here in the States. And I'm sure more than a few Knights will crack open a cold beer or two and watch the Sweet 16 starting tonight. 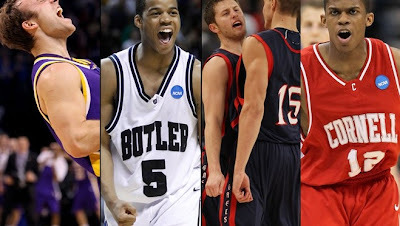 Here's a fun fact: If your Final Four prediction was the most unlikely combination of Cornell, Butler, Saint Mary's and Northern Iowa YOU STILL HAVE A LEGITIMATE CHANCE! •Kevin Pittsnogle, West Virginia (2005-06). Sweet 16 all-name runner-up: Tweety Carter, the point guard from Baylor. He arrived as a scorer - 7,457 career points as a Louisiana high-school phenom attested to that - but Carter has matured into a top-flight floor leader. Tweety's given name is Demond (pronounced DEE-mond), but acquired the nickname because of the crying sounds he made as an infant. Cornell is 1-0 vs. Kentucky (82-77 victory against Adolph Rupp's Wildcats, an eventual 13-13 team, on Dec. 28, 1966, when the Wildcats had Pat Riley and Louis Dampier, one season after UK fell to Texas Western in the 1966 NCAA final). UK is 11-3 all-time against Ivy League teams. Kentucky is headed to Syracuse's expansive Carrier Dome, great news for the legions of ticket-hungry UK fans. But do they remember this? Kentucky is 0-3 all-time at the Carrier Dome, including two regular-season losses against Syracuse. This is the 11th time for West Virginia coach Bob Huggins to earn a top-four seed in the NCAA Tournament. On eight of those occasions, all with the Cincinnati Bearcats, Huggins' team failed to reach the Sweet 16. 2009: Villanova def. Pittsburgh (Big East). 2002: Oklahoma def. Missouri (Big 12). 2000: Wisconsin def. Purdue (Big Ten). 1992: Cincinnati def. Memphis (Great Midwest). 1992: Michigan def. Ohio State (Big Ten). 1990: Arkansas def. Texas (Southwest). 1988: Kansas def. Kansas State (Big Eight). 1987: Providence def. Georgetown (Big East). Since capturing the 2001 national title, Duke coach Mike Krzyzewski has lost five of his past six appearances in the regional semifinals. There are two former Hillsborough County players in the Sweet 16 - Butler junior guard Shawn Vanzant (Wharton) and Cornell freshman guard Johnathan Gray (Berkeley Prep), a former student manager who was added to the team in December. Connections? Last season, Michigan State had its sights set on Detroit, site of the Final Four, and it reached the championship game. Spartans coach Tom Izzo just toppled Maryland at Indianapolis, where he won his only national title (in 2000 with Mateen Cleaves, Morris Peterson, et al) and toppled overall No. 1 seed Louisville in last season's Midwest Regional final. Now it's off to St. Louis, where the Spartans defeated Kentucky in 1999 to earn the first Final Four berth under Izzo. Larry Harrison, the West Virginia assistant coach, once helped to launch Tampa's Riverfront Park Summer Basketball League. He also served as assistant at Jefferson High School and Hillsborough Community College. Now he's the longtime right-hand man for Mountaineers coach Bob Huggins. The second-round loss by Kansas once again means the NCAA Tournament's overall No. 1 seed has failed to win the national championship. Since the overall No. 1 seed debuted in 2004, only the 2007 Florida Gators have gone all the way. Ohio State vs. Tennessee in the Midwest Regional semifinals is a rematch from 2007, when the Buckeyes rallied from a 17-point halftime deficit to defeat the Volunteers 85-84 in a regional semifinal at San Antonio. The coaches remain the same (Ohio State's Thad Matta and Tennessee's Bruce Pearl). Star players David Lighty of Ohio State and Wayne Chism of Tennessee played in that game as freshmen. Three double-digit seeds have reached the Sweet 16 (No. 10 Saint Mary's, No. 11 Washington and No. 12 Cornell), duplicating the feat of 2008, when No. 10 Davidson, No. 12 Western Kentucky and No. 12 Villanova pulled through. There were no double-digit seeded teams in last season's Sweet 16. The state of Texas tied an NCAA record by sending seven teams to the NCAA Tournament (California did the same in 2002). Fittingly, the last team standing, the Baylor Bears, is headed to the South Regional Sweet 16 event at Houston's Reliant Stadium, site of next season's Final Four. It's the 30-year anniversary of Purdue's last Final Four appearance - when Coach Lee Rose and Joe Barry Carroll led the Boilermakers into Indianapolis, some 61 miles from Purdue's campus. Note: The Final Four is back at Indy. 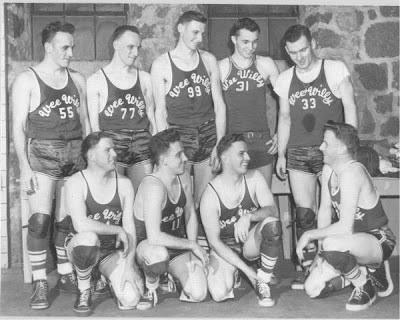 And finally, for no other reason than I love old photos, I present the Marathon Brewery Company's Wee Willy Basketball Team from (Marathon City Brewing Co. 1881 - 1966 Marathon, Wisconsin). The team won more than 500 games while losing 50 during the 1940's and 1950's. 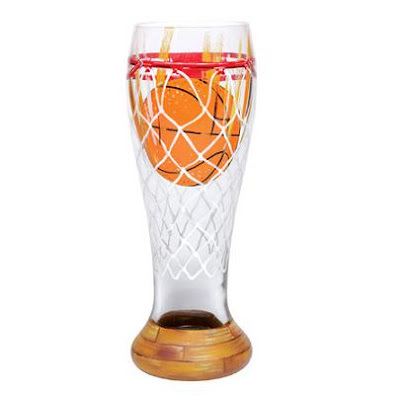 So fellow Knights, enjoy your favorite beer and watch a game or two. .......i'm sure his nickname is Sherlock. What's up Sherlock?! No Wee Willy Sweatshirts for me Sir D! LOL! So much for Kentucky not winning in Syracuse. And Tennessee is going to beat Ohio State tonight to play Michigan State in the Final Four. Cornell is back to being a book worm. I'm winning the Poll at Cheeseburger in Paradise and ranked number 300 in the Mike and Mike ESPN Poll. I have Tennessee beating Kentucky in the final. Remember, you read it hear first! ummm, Did the Oracle of Warrick speak correctly yesterday or what!???!!!! Tennessee vs Kentucky coming up in April! If you're gonna make predictions you got to put money on it... this is the mark of an Oracle growing some. The money is on it! UK loosing last night just sealed the deal for me, even if Tennessee doesn't win the shooting match. Too bad you can't join me for my money collection and beer guzzling event at Cheeseburger in Paradise next week! Sir Hook the Oracle With Balls of Warrick! Big Money...$5 and I win $150! I'm off to check the las Vegas Bookies to see if i can get some of the Kentucky action.